These dainty little flowers are super easy to make. Even the curd is easy because it’s made in the microwave! 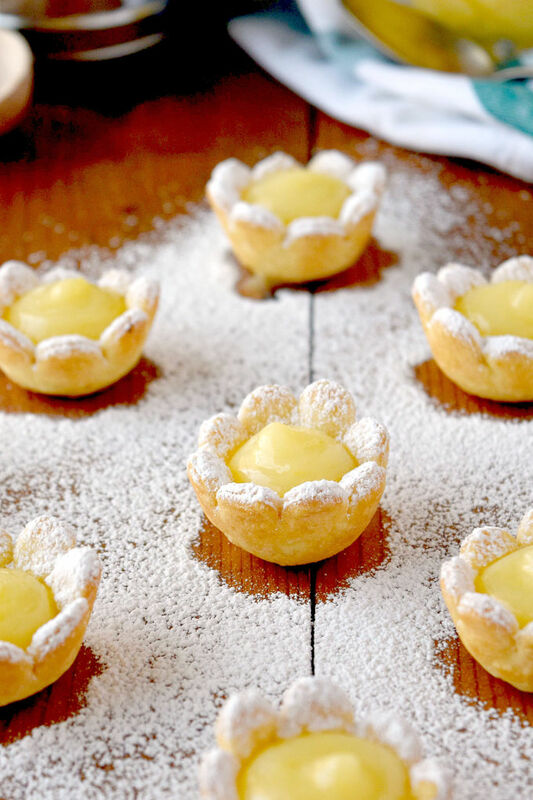 Lemon Daisy Tartlets are super cute and packed with sweet tart flavor of fresh lemon curd. They’re perfect for spring time menus! I think citrus desserts are awesome. Lemon cookies, key lime pie, orange cake; I think they taste so so good. They are sweet and tart all the same time. Which is perfect for me because I don’t like my sweets super sweet. And they’re perfect for spring because of the bright flavors and colors. Unfortunately for me, the hubs doesn’t like citrus desserts. Actually, he’s not a huge citrus fan at all. Which is sort of strange because one of his signature dishes is piccata. And that has what in it? But I guess it’s not enough lemon to make him not like it. I made Meyer lemon olive oil muffins that had a slight flavor of lemon to it for me. He tasted one and said they had too much lemon flavor. Seriously? It’s just slightly lemon-y! You’ve got to be kidding me! It was at that point I realized he was just sensitive to citrus; especially lemon. Just like I’m sensitive to cilantro. But, that doesn’t stop me from making citrus desserts. 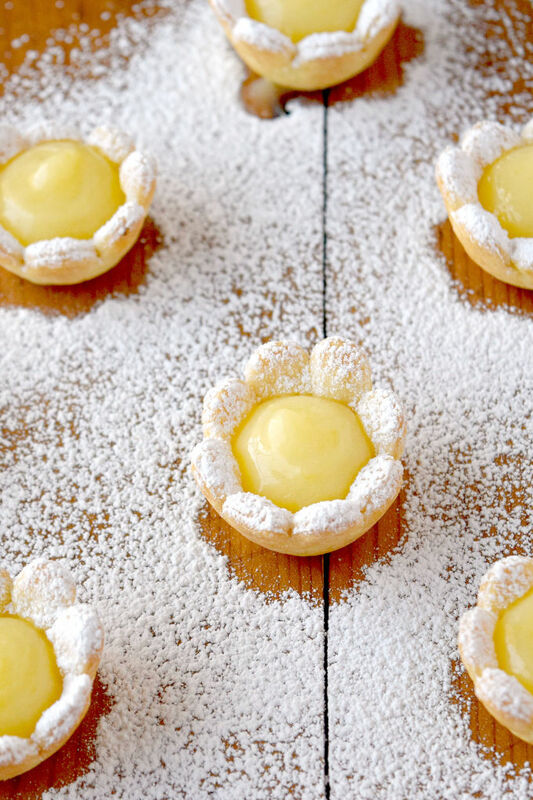 For #SpringSweetsWeek, I wanted to make some lemon curd tartlets. I thought they would be super cute and delicious. But as I was cleaning out the pantry I came across this flower shaped cookie cutter and thought, why not make them like a flower? In the shape of a daisy! I could sprinkle the “petals” with powdered sugar and have the bright lemon curd be the center of the daisy. However, what is perfect is this microwave lemon curd. Yes. I said microwave lemon curd. If you haven’t made it in the microwave you should try it. It makes a curd super simple to make. This curd was ready in under 10 minutes. And I’m giving you an extra minute or two for juicing your lemons the hard way. I used a squeezer to juice my lemons. See how pretty that simple little cookie cutter looks? And how pressing them into a mini muffin pan made the cutest little flowers? I used the handle of a wooden spoon to sort of press the petals of the flower over the edges of the muffin tin. It created an indent in the raw dough, but they didn’t really bake that way in the oven. I was hoping. Maybe a few of them had that little indent, but you can’t really tell after sprinkling them with powdered sugar. I did try to re-roll the dough bits, but they didn’t work out. Every time I roll dough out, I have difficulty with thickness. So, those that I re-rolled out were too thick. If you do re-roll your dough it will make more tartlets, but you will have plenty of curd for them. I still have about 1 1/2 cups left in the fridge for me to nibble on. I’m thinking scones. In fact, I think it was scones that lead me down the curd path. Isn’t curd served with scones sometimes? I could be wrong. And that wouldn’t surprise me if I was. I’ve never had a high tea to know what’s proper with scones and what’s not. Either way, I plan on having the curd with some scones. Maybe I’ll share that recipe with you. Stay tuned! They just look so bright and pretty! I love how they came out. Those white petals and yellow curd center really remind me of daisies. They are the happiest of flowers! Daisies make me smile every time I see them. And these made me smile every time I looked at them. So, true story. That cutting board they’re on came from Nana’s kitchen cabinet. You know that old school style made out of wood? It had drawers for flour, sugar, salt, etc. I only use it to take pictures for the blog. I sprinkled the flowers with powdered sugar and filled them with curd. Then I lifted the board over to my “studio” to photograph them. There’s apparently a good reason I don’t use that board for real life cooking. There’s a gap right down the center! Yup! I had three small lines of powdered sugar on the granite counter top. I had to laugh and share the picture with a few blogger friends. I thought it was too funny! All that time I’ve used that board I never noticed the gap until now. You can make these ahead of time. You make the curd and refrigerate it. Then you make the tartlet shells. This is where you could stop and store the shells in an airtight container a couple of days. When you’re ready to serve them, sprinkle with powdered sugar, fill, and serve. There’s enough curd to fill probably 3 times the amount that these two pie shells make. It made about 3 cups of curds, I think. Maybe it was 2 1/2, but it’s plenty for many many tartlets. So, not only is this easy to make ahead, but you could easily feed a crowd with these little gems. See? Don’t they just make you smile? You can easily see that crack, too. It’s right down the center of the board. Yes. I know I could glue it back together, but I don’t really want to. It’s a great prop to use. And it has historical and family meaning to me. Nana is the reason I have a ton of cookie cutters and one of many reasons I love baking cookies. And, well, just my love of baking. Now, this is the most important part! They don’t store well. Eventually the curd makes the crust soggy. So, as a sacrifice, you will have to eat any leftovers that you have assembled. I know, it’s going to be difficult. But, I know you will step up and make the sacrifice. While you’re stepping up, make sure you enter the giveaway at the bottom. You can read about the prize packages here. And don’t forget to check in on what the rest of the bloggers served up today. It’s going to be a great week of sweets! Melt the butter and allow it to cool slightly. Combine the sugar with the egg yolks and egg in a large microwave safe bowl (I used a glass 4 cup measure pitcher). Using a whisk, slowly add the cooled butter. Stir in the lemon juice and lemon zest. Microwave on high at one-minute intervals, stirring in between, until the mixture thickens and coats the back of a spoon. This took about 4 to 5 minutes in my microwave. Pour the curd into a fine mesh strainer to remove any cooked bits of egg or lemon zest. Using a flower shaped cookie cutter, cut out daisy shapes and place in a mini muffin tin. Bake at 375 for 5 to 7 minutes or until the edges of the daisies just start to turn brown. Remove from the oven and cool slightly in the pan before removing completely to a wire rack. Once cooled, dust the daisies with powdered sugar before filling with the lemon curd (I used a small spoon, but you could pipe the curd as well). Serve immediately. These are so stinkin’ cute. And I love that they look both sweet and playful but also elegant for fancier spring entertaining. Thank you! They’re so easy to make, too. Easy for spring entertaining. I love the detail of using the daisy cutter! I have a graduated set and I can’t wait to make these darling treats. So perfect for spring. Such a simple technique with a pretty result. Let me know if you try them. I can’t get over how perfect these look. They are like delicious little flowers! I especially like that nice dollop of lemon curd in the middle! Thank you. They’re the perfect little bite of sweet and tart. Oh! I love this one this one, lemon tartlets are my favorite. I need to make these for my P.E.O. sisters. Our flower is the daisy. Perfect! I hope they like them. So I get to eat my own little flower shaped pie? I am in for sure! Actually, I better keep two for myself! These are so cute and I love the fresh lemon flavor! Lemon is my favorite and these little flower bites are so pretty ! I just love these! They look like they’d be served at a high tea! I LOVE lemon desserts, especially for the spring! How funny that your husband isn’t into them at all. My fiancé isn’t a huge dessert person at ALL which feels like a cosmic joke to me 😉 These little tartlets are adorable! That’s why we bake and take, right? Take to work, school, etc. These little tartlets are so adorable! I love citrus desserts – they’re so refreshing. Using a cookie cutter to shape the tart shell is brilliant! They are so sweet looking. I love the flavor of lemon in the spring. Very clever using a cookie cutter for the pie crusts. They turned out perfectly. I’m with you….Love citrus!